Boots wanted to launch its No7 Foundation Match Made Service to existing customers of the brand and get them to introduce it to others. Key insights into the Facebook audience and from Nielsen, such as "45 per cent of mums have asked for a recommendation from a friend about a product or service", were used to produce a content plan to engage female consumers. Expert content, videos, pictures and conversation were used to encourage women to try the No7 Foundation Match Made Service for themselves. In particular, No7 wanted to reach women aged 35-44 who were in "discovery" mode. This included existing No7 fans, as well as new ones on Facebook. There were three phases to the ad campaign: launch, recruitment and mass awareness. At a time of year when many women "reinvent" their appearance for the start of a new season, Boots launched the campaign on Facebook with a reach block targeting 6.5 million women aged 18+ in a 24-hour period. Throughout a ten-week campaign, content was published to the No7 Facebook page, including expert videos from the celebrity make-up artist Lisa Eldridge, the Heart Radio beauty duo Pixiwoo and ITV’s This Morning. Following the reach block, up to three weekly page posts were amplified to beauty influencers, No7 fans and their friends using page post ads. After launch, friends of No7 fans were also targeted with sponsored stories, which amplified the engagement of their friends who were already fans of No7 on Facebook. Ads and sponsored stories in news feed on both mobile and desktop resulted in the highest engagement across the campaign. More than half-a-million women have been "Match Made" to date. A spokesperson for Drum and OMD said: "When looking for health and beauty advice, women first look to experts to guide them and then their friends for support and affirmation. This campaign was successful because we worked with respected make-up artists to promote trial of the service by showing how it works. Publishing this inspirational and informative content on Facebook, we created an opportunity for an audience eager to share their experiences and so become powerful advocates for the brand." "Anyone who knows me will appreciate the irony of me even commenting on a campaign for beauty products. So, I’ve focused on the process. And it’s a good one. "I’m a big fan of using content in the social space, and there’s some engaging content on the No7 Facebook site that women might ‘actually’ find useful. The user journey that the site encourages is also really simple: go to the site, discover the product, get some tips, buy and try the product, seek affirmation from your friends, advocate the Facebook page etc. "Great media partnerships ensure the campaign gets well-targeted reach, and when people go to the site there’s enough engaging content to ensure that they stick around." "The golden rules of Facebook success are brutally simple. The key is applying them all together. "Page engagement comes from ongoing narrative with consumers from that page. Brands must provide ongoing reasons for consumers to engage. This needs to be in the form of utility, unique content or value. No7’s campaign is fresh and built around content that adds value. "Facebook advertising will build reach, engagement and amplification but should be built around this central experience. No7 gets this right. The advertising is planned to sustain and amplify the experience. "Being nitpicky, consumer insight is the only area in which I would have liked to see more from this case study." "The case history notes talk about ‘launching Boots No7 Foundation Match Made Service’ with ‘inspirational and informative content’. The work is good but I have one gripe. It might be informative, but it’s not very inspiring. 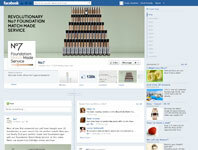 "The Facebook page has tips, pictures, vouchers, chat. But 35- to 44-year-old women have seen all this on printed pages. The difference should be the content and, although there’s more here than you can shake an eyebrow pencil at, it’s a bit dull. The best work in this sector was a bit of theatre – Dove achieved it with ‘real women’, Dermablend with Zombie Boy Rich Genest. "Half-a-million women have been Match Made since launch, so they’re doing something right. But not everything." "I don’t tend to get involved with foundation because cosmetic companies haven’t come up with a shade pasty enough. I am the target audience, though – women over 35 who are in ‘discovery mode’. If ‘discovery mode’ is adspeak for sinking into a depression because your skin is getting lined, then I’m in. "There were some ‘top tips’ on there such as ‘add a touch of bronzer to get a healthy glow’. I won’t be doing that because it might frighten people, but the ‘how to’ approach is a good route for the brand as most non-experts need some help."